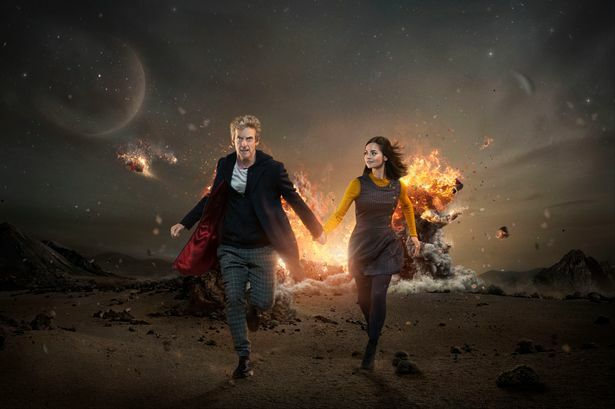 The Doctor and Clara Oswald will be back in a little over a month for Series 9 of Doctor Who. It looks to be a lot more of the same, but you know what? That's exactly what I want! Here's the second trailer for Series 9. There's a lot going on in this trailer, and at this point none of it makes any sense. So let's take a closer look. The trailer starts with a shot of the TARDIS. And the Doctor bursts through the doors with a concerned look on his face. "Sorry I'm late!" How can a time traveler be late so many times? The TARDIS as it always is, spinning through space (and time). "He hasn't got a plan yet." Does the Doctor ever really have a plan? He sorta just wings it most of the time. Clara and special guest star Maisie Williams from Game of Thrones. The Doctor looking up and concerned. Armored aliens that kinda look like Cherno Alpha from Pacific Rim. The Doctor and Clara backing away looking concerned. Those aliens are ready to shoot! "He will have..." a plan that is, as we see the Doctor in a crystal/amber hallway. "And it will be spectacular." Or as Barney Stinson would say, legendary, as the Doctor has another concerned look on his face. First aliens that look like Jaegers, now aliens that resemble the Pale Man from Pan's Labyrinth. Is series 9 an homage to Guillerlmo del Toro? Rigsy from the episode Flatline returns, and he looks shocked. Zygons! Last seen in The Day of the Doctor, the 50th Anniversary special. Clara has a rocket launcher. Wait, what? Maise and the Cowardly Lion? Beast from Beauty and the Beast? A ThunderCat? So is this Gallifrey? Update: Apparently this is Skaro, the home planet of the Daleks. Or is it Spaceball City? A glass chamber in an ornate room. This might as well be where Superman can have his powers taken away from him. This alien is just looking for some wicked waves. Clara defends herself with a wand from Harry Potter? And that concerns the Doctor. The Doctor is perpetually concerned. And Clara is concerned, rightfully so. Daleks are dicks. Closeup but still can't see any features. A ghostly man wearing some old Victorian clothing. This guy looks like he slept face first on a George Foreman grill. The Doctor on a horse. Another alien. Looks kind of like a bony turtle. The Doctor has now gone from concerned to angry. And it's Maisie's turn to look concerned. Someone running to a police station. The Doctor channels some Mad Max guitar playing. Missy's back, she's crazy, and she's talking with Daleks. This cannot be good. Just like old times. The Doctor and Clara running. So that cat creature from before can breath fire. The Doctor jumps out a window. The Doctor is prepared for some Risky Business. "What is happening?" Colorful Daleks are still dicks. Finally someone smiling in this trailer. The Doctor gives his best Richard Nixon impression. "Just the Doctor and Clara Oswald in the TARDIS." And I'm completely fine with just that. Doctor Who Series 9 premieres on BBC One on September 19th. It's Finn and a Lightsaber!